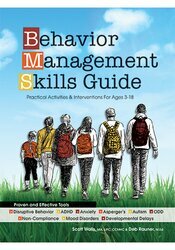 Behavior Management Skills Guide is a unique resource that covers the process of changing behavior in children and adolescents - from start to finish. With decades of clinical and classroom behavior management success, authors Scott Walls and Deb Rauner have written a comprehensive manual featuring the best methods for effective change. The authors have identified 3 levels of negative behavior components and have paired these levels with interventions proven to increase positive behaviors and skills. Filled with strategies for individuals or groups, this guide also includes downloadable and ready-to-use assessments, exercises, tools and forms. Scott Walls, MA, LIPC, CCMHC, is a mental health counselor, consultant and national speaker and owns a private practice in Lincoln, NE. He is the founder and Director of KICKS Counseling and the Lincoln Karate Clinic. He is the co-author of Behavior Management Skills Guide: Practical Activities & Interventions for Ages 3-18 published by PESI Publishing and Media. Deb Rauner, M.Ed., is currently an autism consultant and was a special education teacher for 33 years. Her expertise includes Applied Behavior Analysis (ABA), functional behavior assessment, programming for students with autism, and designing ABA classrooms using verbal behavior strategies.